I can’t wait to have fun with these homemade chore dice I just made! I recently stumbled across this post at She Wears a Flower. 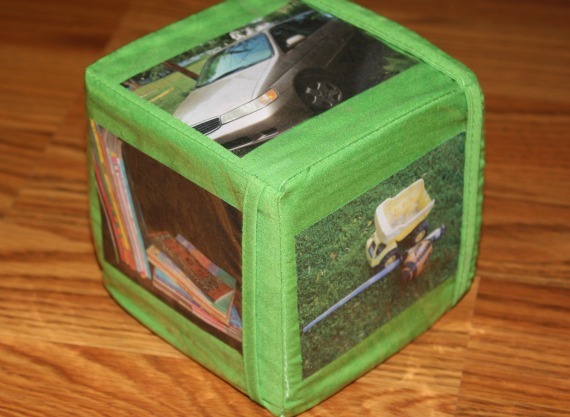 She actually sewed and created her own soft chore block. Well, it got my brain turning – can you hear those gears grinding – and I thought it might be a fun addition to a part of life that has been known to elicit pure joy an occasional groan or two around here. 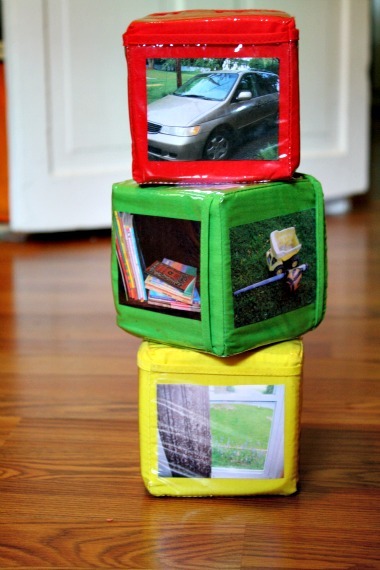 I started with these photo blocks that I bought on Amazon a couple years ago for use in our homeschool. 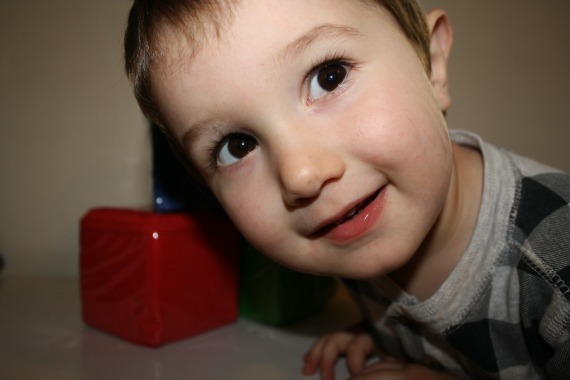 There are so many ways to use these things – they’re great! And if you don’t have these blocks I’ve got some great, frugal alternatives near the end of the post, so keep reading. Next I had to decide what chores I wanted to include in this project. I decided to pick tasks that need to be done at least weekly. My children will still have their regular responsibilities to complete each day. I’m not making an extensive list for this project yet because we are moving to new house in a month. I’ll wait to add more chore cards until we’re settled into a new routine there. These are the chores that made my list for now: clean the car, pick up the yard, clean the windows, wipe down microwave, straighten bookshelves, sweep the porches, and parent’s choice. None of my children could resist stepping into the pictures. I wanted it to be easy for the non-readers in our home to quickly identify the chore they rolled so I took pictures instead of just writing the tasks on a piece of paper. You could just cut pictures from a magazine or your children could draw pictures if you don’t want to take photographs. I’ll laminate the pictures and keep them in a handy place. As I add to the collection, I can just switch them out based on what needs to be done around our home. This will include tasks that need to be done monthly or less frequently. 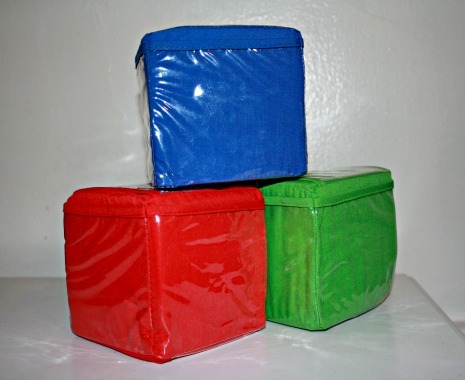 Turn square tissue boxes into your dice like The First Grade Parade. 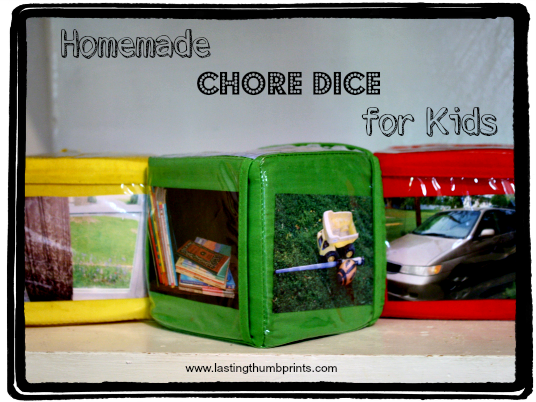 Download a free chore dice printable for a quick and easy start at Spoonful. Check out this tutorial for wooden chore dice made from wood scraps by Delia Creates. 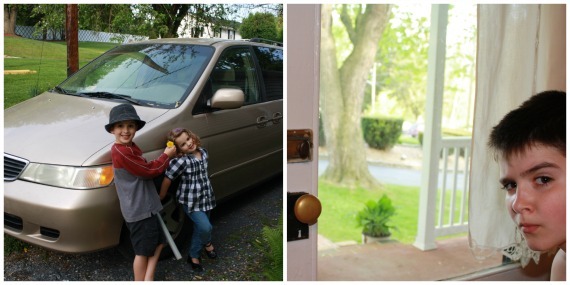 Do you have any creative ways to add fun to chore time? Please share! I love this idea! What a fun way to add a little excitement to chores.